I first came to Tokyo by accident on the way to Canada. That was in 2006. Since then I have visited more or less every year — for the culture, the food, the people, the art, the general ‘atmos’ and the ongoing discoveries that this city affords. Before I came, I imagined Tokyo to be teeming with people, hedged in by high-rise buildings, rushing around, packed in like sardines. Many trips later, I find this city to be a sensory vortex, a perceptual oasis in the rush of my own life, affording the opportunity to sample and explore a rich and complex culture. Home to some 20 million, Tokyo consists of many sub-spaces, urban villages, each with its own atmosphere, able to modulate a kind of slowness within. I have been here more than a dozen times, and each time find a new pocket to explore, a new gallery, restaurant, side street, whatever. I could come 100 times and the story would be the same. Movement is carefully mapped here, the body marshalled for exactitude. I really like the fact that people bow to each other. I was at a screening of a dance program, shown as part of the 2017 Multiple Futures exhibition at the Tokyo Metropolitan Museum of Photography (TOP), where the curator of the screening introduced herself; the entire audience bowed in their seats. People bow in shops, to say hello, goodbye, to introduce themselves, to show respect. It’s nice. Purchases are artfully wrapped, food is exquisitely prepared, details are important in everyday life, at least within the public sphere. There is probably a downside to all this attention to detail, an imperative to conform, perhaps. You can find old coffee shops (kissaten) where brews are made under laboratory conditions. I remarked upon this to a friend once, impressed by the care taken. He suggested that there is a ritual dimension to everyday life, a more or less unbroken feudalism extending into the present that calls for a certain absorption within, and commitment to, action — which we might call Zen. Food is a delight in this city. I cannot emphasise this enough! There are small restaurants, where you buy tickets from a machine for any number of noodle variations, fresh soba, delectable stock, all under $10. Or you can have a seasonal, degustation meal (Kaiseki) with 10 courses, each in signature dishes for much more. Every visit I walk into new places off the street, there are countless options. The Japanese love French cooking and there are many French restaurants and patisseries with the names of well-known French chefs. All the department stores have basement food halls (called depatchicka). These offer an amazing array of cooked dishes, food from around the world, raw ingredients and cakes, loads of cakes. The Japanese love a seasonal theme. In Autumn, it’s chestnut, in Spring, it’s cherry blossom. And there’s Halloween and Valentine’s Day. A great deal of attention is paid to the seasons. Exquisite flower arrangements in high-end buildings reflect the seasonal moment. Food embraces the shifting supply of produce. Getting around is extremely easy. Tokyo Metro has numerous lines, well labelled, that criss-cross the city. Millions of people use public transport here — the trains fill up, move on, new ones immediately arrive, fill up and so on. To observe this from outside the aim to get from A to B is to witness an awesome system at work, that sets a time and sticks to it. Public transport is privatised, like many services and institutions. Consequently, they all stop close to midnight — a major pain in the arse for anyone who likes to stay up late. I have no idea what people do (other than take taxis or hole up in capsule hotels). Maybe that’s why so many people live in the area of Shibuya, home to a great deal of youth culture nightlife. Although there are a few national and city museums, many more are privately owned and therefore have to be researched. A lesser known favourite of mine is the Ota Memorial Museum of Art in Harajuku. It features changing displays of Japanese wood block prints (ukiyo-e). These are wonderful, giving a sense of life during the Edo period in old Tokyo, or of the arts, particularly Kabuki theatre. There are many images of famous Kabuki actors, performing familiar tales. These are superb, fleshed out in indigo, salmon pink and aquamarine, with flowing black lines. Each month will have a different theme, selected from the thousands of woodblocks in the collection. The Nezu Museum in Aoyama is exquisite, from its modernist Japanese housing to its fine collection of ceramics, to its finely tuned garden. 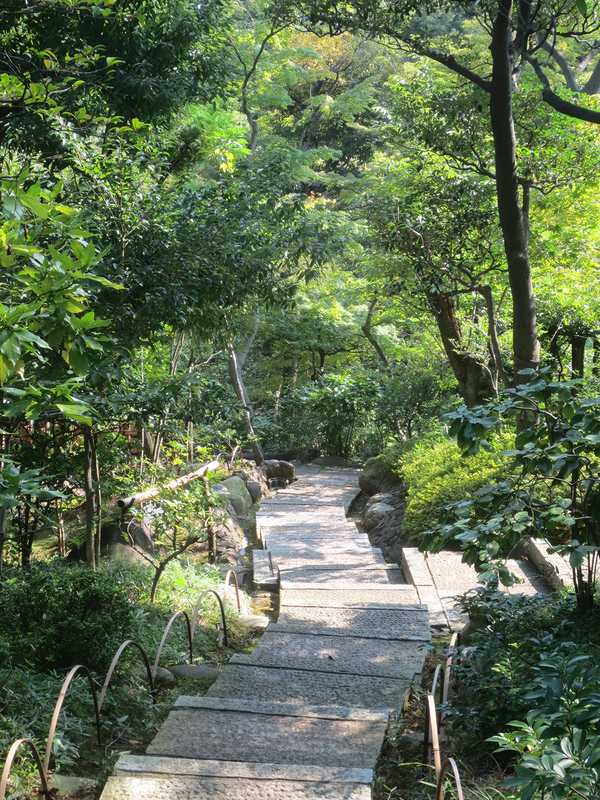 The approach to the museum follows a long pathway, flanked by a wall of bamboo, and a river of stones. Its internal spaciousness creates an aura that enhances the appearance of each individual item. People often write about the cosplay youth culture that plays out in Harajuku and Yoyogi Park, where people dress up as particular characters or identities and roam the streets together. On the weekend, you will see young men and women rolling suitcases crammed with clothes and makeup, ready for a day’s outing. And yet, I have heard it claimed that this cultural fiesta is ebbing. When I first visited Tokyo more than a decade ago, young women would be immaculately made up, their nails artworks in miniature, complemented by high heels and skirts. Now, female dress codes are much more relaxed, often featuring jeans and sneakers. Times change. The 2020 Olympic Games is bound to institute more change in the social landscape of the city. People work long hours here. As a tourist, I do not see the ways in which the domestic sphere is organised and the home managed, what sexual politics arise and how personal space is negotiated. Having just started to learn Japanese, however, I am beginning to have a sense of certain differences that are reflected in the arrangement of words, their content and style. Raising these issues, I realise the very particular perspective that tourism affords. Inevitably framed by its limits, I am nonetheless thoroughly indebted to this urban culture for furnishing me with so many delights.